For other people named Ferenc Molnár, see Ferenc Molnár (disambiguation). The native form of this personal name is Molnár Ferenc. This article uses the Western name order. 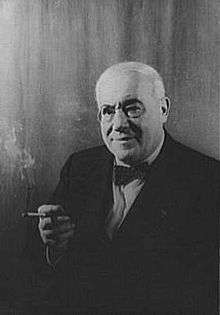 Ferenc Molnár (birthname Ferenc Neumann; 12 January 1878 – 1 April 1952) was a Hungarian-born dramatist and novelist who adopted American citizenship. Molnár was born in Budapest. He emigrated to the United States to escape persecution of Hungarian Jews during World War II. As a novelist, Molnár may best be remembered for The Paul Street Boys, the story of two rival gangs of youths in Budapest. It was ranked second in a poll of favorite books as part of the Hungarian version of Big Read in 2005 and has been made into feature films on several different occasions. His most popular plays are Liliom (1909, tr. 1921), later adapted into a musical (Carousel); The Guardsman (1910, tr. 1924), which served as the basis of the film of the same name, which starred Alfred Lunt and Lynn Fontanne (1931); and The Swan (1920, tr. 1922). His 1918 film, The Devil, was adapted three years later for American audiences, starring George Arliss in his first nationally released film. The 1956 film version of The Swan (which had been filmed twice before) was Grace Kelly's penultimate film, and was released on the day of her wedding to Prince Rainier. Molnár's play The Good Fairy was adapted by Preston Sturges and filmed in 1935 with Margaret Sullavan, and subsequently turned into the 1947 Deanna Durbin vehicle, I'll Be Yours. (It also served as the basis for the 1951 Broadway musical Make a Wish, with book by Sturges.) The film version of the operetta The Chocolate Soldier used the plot of Molnár's The Guardsman rather than the plot of its original stage version, which was based on George Bernard Shaw's Arms and the Man, because Shaw reportedly disliked the operetta adaptation of his work, and would not allow his plot to be used for the screenplay. Molnár's play Olympia was adapted for the movies twice, the first time (quite unsuccessfully) as His Glorious Night (1929), and secondly as A Breath of Scandal (1960), starring Sophia Loren. In 1961, Billy Wilder and I. A. L. Diamond turned Molnar's one-act play Egy, kettő, három into One, Two, Three, a film starring James Cagney and Horst Buchholz. His play, The Play at the Castle, has twice been adapted into English by writers of note: by P. G. Wodehouse as The Play's the Thing and by Tom Stoppard as Rough Crossing. Molnár served as a proud and jingoistic supporter of the Austro-Hungarian Empire while working as a war correspondent during the First World War. So positive were his war reports that he was decorated by the Habsburg Emperor, but criticized by some of his pacifist peers. He later wrote Reflections of a War Correspondent, describing his experiences. Molnár died, aged 74, in New York City, where he settled, via special immigration legislation, which was passed by the United States Congress, according him the status of returning [permanent] resident, to wit, Private Law 88-122/H. R. 3366, approved/enacted 19 December 1963 and retroactive to 9 December 1961. It is unclear if Molnar ever became a naturalized United States citizen. ↑ A Dictionary of Twentieth Century World Biography. United Kingdom: Book Club Associates, 1992, p. 395. ↑ 88th Congress (1963) (19 December 1963). "H.R. 3366 (88th)". Legislation. GovTrack.us. Retrieved 15 January 2014. An Act for the Relief of Ferenc Molnar. Wikimedia Commons has media related to Ferenc Molnár.